We look for a “resting room” on arrival, but there’s none to be had. Irkutsk is obviously a popular one. Good thing we didn’t cancel our booking at Vitim, a tiny hotel that sits practically across from the station. Outside on ul. Chelnokova, as the morning chill begins to dissipate, people are slowly but surely beginning their day. Some heading off to work, others picking up or dropping off their loved ones, an elderly gent grabbing the morning edition from a news stand, another lingering by the station cafe. Ever so often, a hulking old tram carves its way through the chaos of a crisp Wednesday morning. Literally waking the night shift, we manage to get an early check in at Hotel Vitim. Showered and ready, and with all our power hungry accessories set up to charge, we head out in search of breakfast. The station has its own share of little cafes, but the bright orange 24-hour establishment across from it catches our attention. We end up with a rather unconventional, protein-laden plate of chicken Shashlik and a Borek-like deep fried bun, stuffed with lamb and cheese, known locally as Pirozhki. Both of which are not too shabby. The coffee, in fact, is some of the best we’ve had on our trip so far. As agreed previously, Ivan shows up at 9 on the dot. And within minutes, we’re off. Our first stop is clearly not on his promised agenda, but he obliges nevertheless. We detour from our route, down to a lovely little park, who’s promenade runs along the east bank of the Angara River. 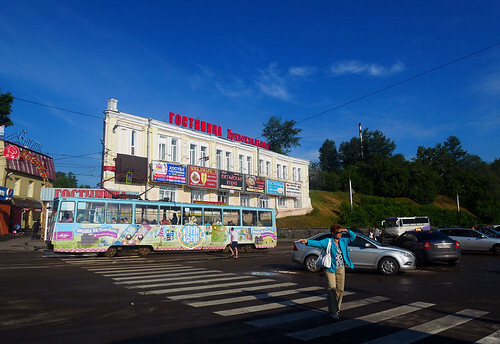 Across from it lies the stately Irkutsk-Passazhirsky station, and we’ve stopped here to photograph precisely that. Ivan is our guide for the day. He works for Baikal Secrets, a tour agency based in Irkutsk, that specializes in day trips to Lake Baikal. He speaks fluent English, is himself well traveled, and is obviously very familiar with this part of the country. He talks us through our route and stops for the day, calling out, from time to time, the city’s important landmarks, as he drives us through it. A Buryat stronghold for the longest time, Irkutsk became a major trading post and administrative center for Eastern Siberia, after the Cossacks showed up there in the late 17th-century. Following the Decembrist Revolt of the early 19th-century, the city provided refuge to exiles, gradually becoming a hub for intellectuals and culture. 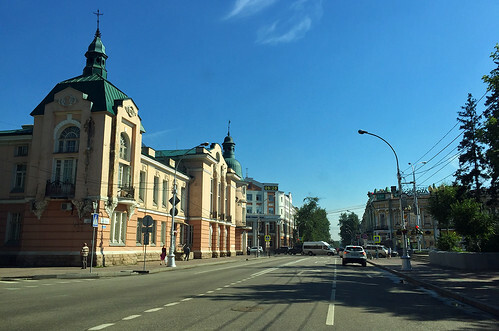 Irkutsk remains one of the largest cities in Siberia today, with well laid out streets, a handsome city center, painstakingly restored timber houses, a vibrant waterfront, and an overall air of prosperity. At a traffic circle on the edge of town, we sight the Angara River once again. The Irkutsk Dam lies to our right, and a road carries traffic over it to the west bank of the river. The dammed portion of the river, also known as the Irkutsk Reservoir, has notably higher levels of water, and on it stands anchored the Angara, a turn of the 20th-century icebreaker ship built in England, now serving as a floating museum. Heading south from that very traffic circle is Baykalskiy Trakt, a picturesque, 70-km (43-mile) long road that connects Irkutsk to Listvyanka, on the shores of Lake Baikal. About half way along it lies Taltsi, home to the Open Air Museum of Wooden Architecture. We peel off the highway here for a visit. 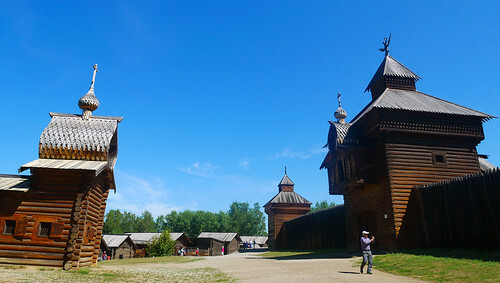 Dedicated to preserving the traditional wooden architecture of Siberia, the museum encompasses original and recreated structures, spanning three centuries, representing the Buryat, Evenki and Tofalar styles of construction. It’s a stunning collection of homes and their attached courtyards – a lot many of them displaced by the damming of the river – a smattering of chapels, and even a fortress; all lovingly restored and beautifully presented. 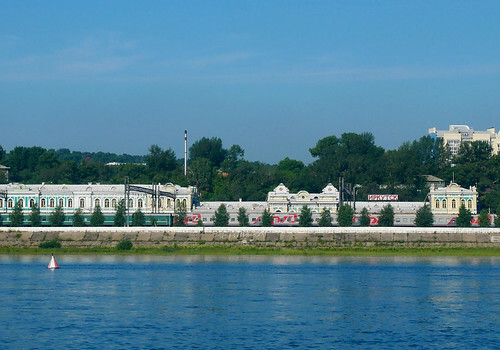 The museum is located on the east bank of the Angara River, complete with its own little beach. Its not the last we’ll see of the Angara though. 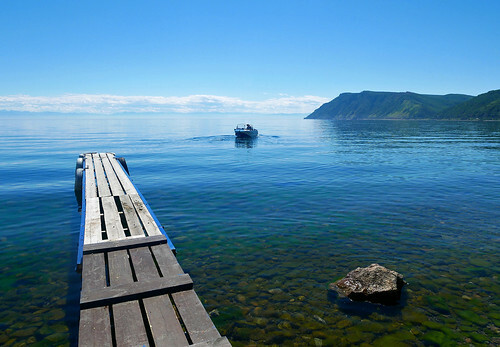 We meet the river again, a little distance to the south, at its very source, Lake Baikal. A sight that certainly takes your breadth away… Pausing briefly to soak in our first sighting of the majestic lake, we’re back in Ivan‘s car, this time headed up a hill towards the lake’s overlook. But the road dead ends shortly after, at a car park. From there, we utilize a chair lift to whisk us up to the summit. Save for a Chinese tour group, its practically empty, a lot of fun to ride, and taking all of 10-minutes to reach the top, is incredibly good value for money too. 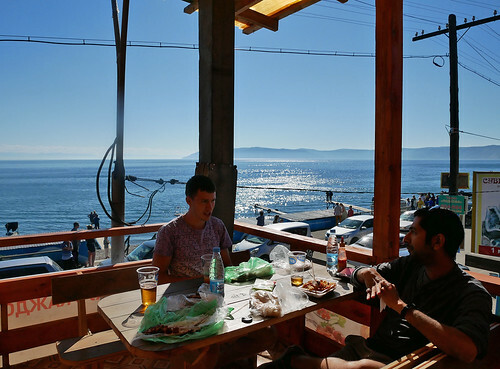 A cafe sits mere feet away from where we alight, and we stop there to refuel – a variety of savory and sweet Blinis (Russian-style pancakes) to snack on, and a Piva for hydration. Then its on to the overlook – now devoid of selfie seekers – for jaw-dropping vistas of the lake. For the return trip, we decide to walk. 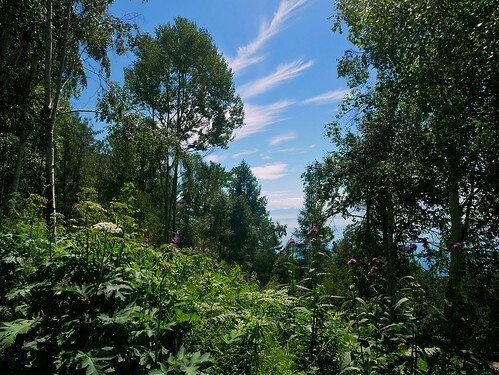 It’s a 15-20 minute hike down to the base of the chairlift, and our parked car, along a beautifully lush forest path, strewn with wildflowers… Ivan drives us back down to the highway, pulling up just outside the Baikal Museum. Its included on our itinerary today, but we decide to skip it, given how stunning it is outdoors. Across from it lies a bus shelter, and adjacent to that, a dirt road that leads down to a ramshackle pier. There we’re met by an elderly gent, commandeering a rickety-looking “speed boat”, which Ivan assures us was not built at said gent’s garage. We head out north initially, in the direction of Irkutsk, slowing to a crawl only moments later, as we come within sighting distance of a large rock. 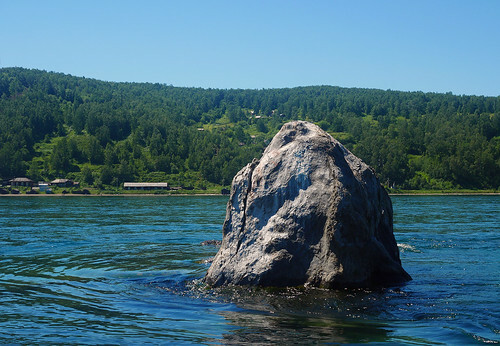 Its the sacred Shaman Stone, the source of many a local myth, and the precise point at which the Angara River meets Lake Baikal. 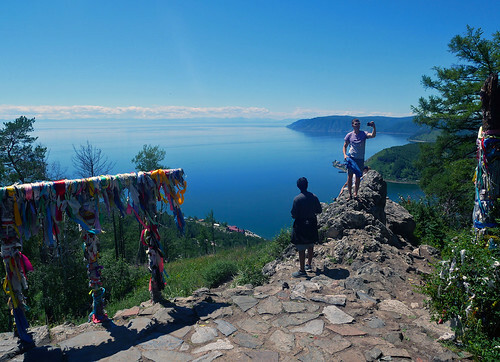 Only the seventh largest by surface area, Baikal holds the largest volume of freshwater in the world, more so than the North American Great Lakes combined. How so? Cause its deep. Really deep. Some 5400-feet (1645-meters) deep at its maximum depth! At 25 million years, its also the world’s oldest. By many accounts, the clearest too. So when Ivan urges us to get our fill, with the palm of our hands and empty water bottles, we oblige. After a ten-minute sprint west, our boatman cuts off the engines and we coast towards the shore. In the distance, all but lost in a mountain of greenery, stands a lone railway tunnel. Not far from it is a pristine pebble beach, from which juts out an idyllic little dock – our drop off point. The tunnel, in fact, is the starting point of our 5-km (3-mile) long trek to Port Baikal, the little settlement that sits across from Listvyanka. 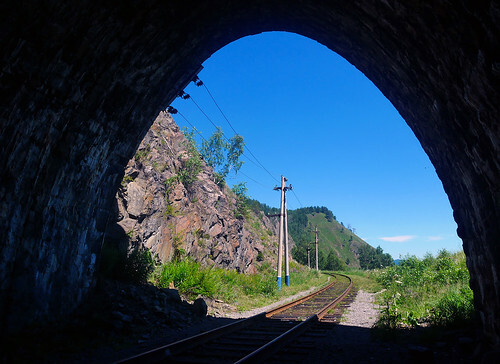 Its the northern terminus of the Circum Baikal Railway, and this tunnel is the last of 38 that dot the 89-km (55-mile) long line. 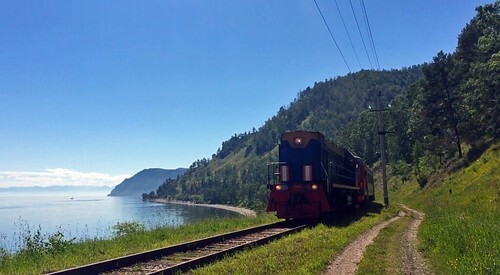 At its southern end, the Circum Baikal Railway meets the Trans Siberian route at Sludyanka. 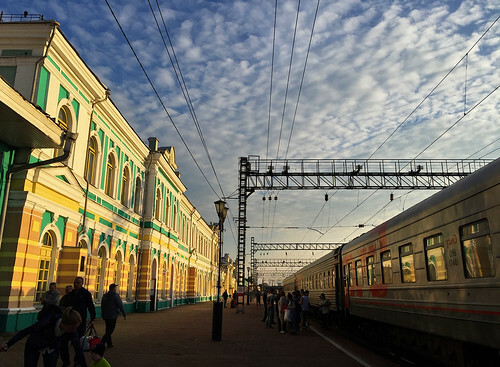 Up until the middle of the 20th-century, it was in fact a vital part of the Trans Siberian Railway, making up the section between Irkutsk and Sludyanka. Before they decided to dam the Angara i.e. The portion of the line south of Irkutsk was disassembled, and eventually flooded, with Port Baikal becoming the terminus of the freshly truncated section. Today, only tourist trains ply the 112-year old route, but Ivan assures us that’s not a common sight. For a change, he’s wrong. A whistle sounds in the distance, echoing across the mountains, and there’s no mistaking it. This has got to be the icing on the cake today – we couldn’t have asked for more. A truly stunning day, an absolute privilege to finally be at Lake Baikal, a hard to beat setting, and now this… Sheer minutes away from its final destination, the train disappears out of sight, but we still have a lot of ground to cover, and a ferry to catch. 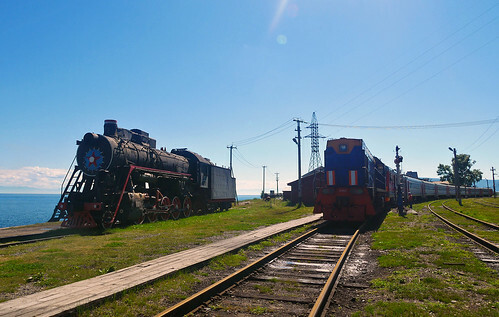 Add to that, we’re also hell bent on photographing the steam locomotive that stands at the other end of Port Baikal station, which many would consider symbolic of the Circum Baikal Railway. We push ourselves a bit, extend our hike some more, and finally make it out to the northern tip of the station. We make the ferry too, with 3-minutes to spare. 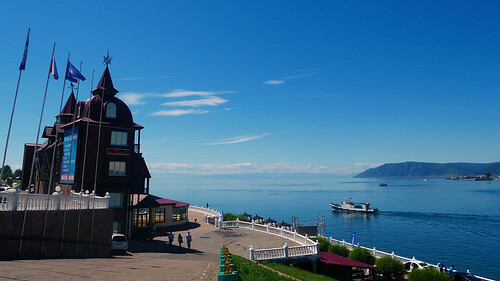 While every other ferry service in the region only advertises its summer schedule, the Port Baikal – Listvyanka ferry sails throughout the year. 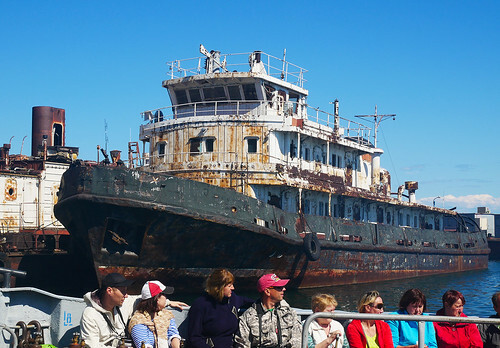 Take one look at it and you’ll realize its no less decrepit than the rest of Port Baikal‘s fleet of rusted hulks. In short, its nothing special. But the channel it plies across – the mouth of the Angara River – never freezes over. Once we’ve made it to the other side, Ivan wastes no time in getting us over to Listvyanka, the only other settlement in this area, and the end of the road from Irkutsk. 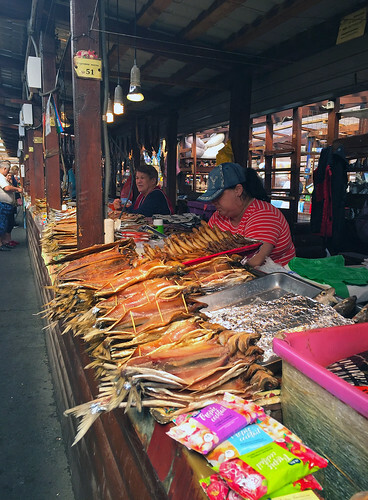 There, by the promenade, stands the local fish market, still doing brisk business this late in the afternoon. Smoked Omul is king here, but Ivan suggests I try Golomyanka as well. Also endemic to the lake, Golomyanka or Baikal oilfish, despite its diminutive size, he tells me, packs more fat as a percentage of its mass than any other fish known to mankind! SK, not quite as partial to the treasures of the lake as I, makes a beeline for some Plov, the Uzbek version of Biryani. With house brewed Pivas in tow, we head upstairs to the rooftop patio. There’s still plenty of sunshine for the taking, and views of Listvyanka‘s buzzing lakefront below. Its a late lunch for sure, but a very memorable one too. Back at Hotel Vitim, with well over an hour to spare for our next departure, we bid dasvidaniya to Ivan. A rather hurried evening cuppa is followed by a quick shower, more battery charging, and finally, some shopping for a few last minute supplies. Then, we’re back at the crowded concourse of Irkutsk station, where it all started this morning. We don’t have to wait too long, as Train 362 is announced soon enough on track 5. Its quite the racial mix on our platform today, and plenty of English being spoken as well, in a variety of different accents. Even our Provodnitsa belts out a few words in Angliyskiy! We are on an international train after all. She’s unable to explain the carriage numbering, however. 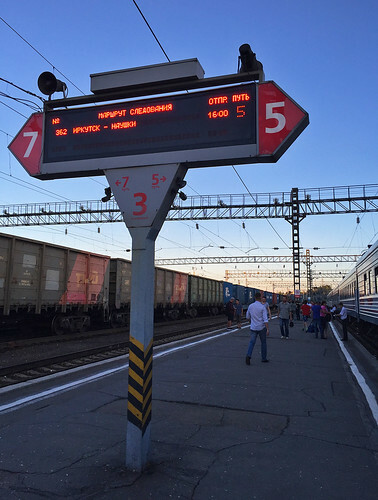 And the departure board displaying “Irkutsk – Naushki” only makes matters more confusing. For now, our guess is that only a handful of carriages are headed through to our final destination. The majority of them will probably get cut off at Ulan Ude or Naushki. Our carriage interiors are definitely a step up from what we’d become accustomed to, but there’s still no air conditioning. Lucky for us that the weather has held up so far. Most of our fellow travelers appear to belong to one tour group, who’s leader seems to have taken over the corridor by now, plastering maps and other tour literature all over. Pulling out of Irkutsk at 9 PM local time, the evening light is just incredible. The Angara River, awash with local anglers out on their little fishing boats, makes for quite the sight. We follow along for a short while, then veer sharply towards the west. 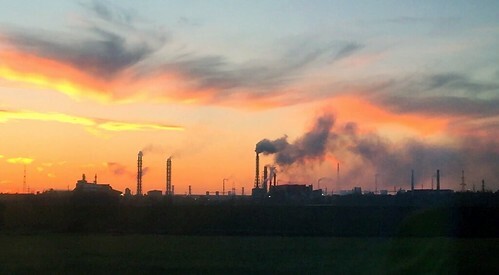 Set against a dramatic late evening sky, the city’s industrial outskirts come into view. Its déjà vu to 2014 for me… Our cabin mate is a Mongolian girl, seemingly separated from the rest of her family a few doors down. Torn between conflicting directions from her somewhat overbearing parents, she looks harrowed most of the time, and shuttles back and forth till its finally time to turn in. Its been a long and exhausting day for us, and we’re ready to call it a night too. But Sludyanka awaits, as does a last glimpse of magical Lake Baikal, under the glow of an almost full moon. Sleep will have to wait. Next on the Magistrale Diaries: Nauskhi, and the International Border. A full set of pics from Day 7 of our trip can be seen here.